Girls monogrammed backpack. Cute and functional for school, trips to the park, or day outing with grandma or auntie. 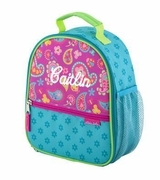 Accented with charm, trims, and paisley appliqués in all the favorite colors little girls love.